Habit: Annual 1.5--18 cm; taproot slender. Stem: spreading to decumbent, leafy. Leaf: basal 1--5 cm, narrow-oblanceolate to -spoon-shaped, withering in fruit; cauline 1--2(4) cm. Inflorescence: axillary, raceme or panicle, 1--4 cm, generally open; bracts narrowly ovate; flowers +- sessile, generally persistent in fruit. Flower: sepals 1--2 mm, ovate to deltate, fleshy, narrowly white on margin in flower, scarious throughout in fruit; petals generally 3, 1--3 mm, pink to +- red; stamen 1; stigma sessile. Fruit: 3--6 mm, oblong to linear, in width generally +- > seed. Seed: 4--10, 0.5--0.8 mm. Chromosomes: 2n=44. Synonyms: Cistanthe monandra (Nutt.) Hershk. 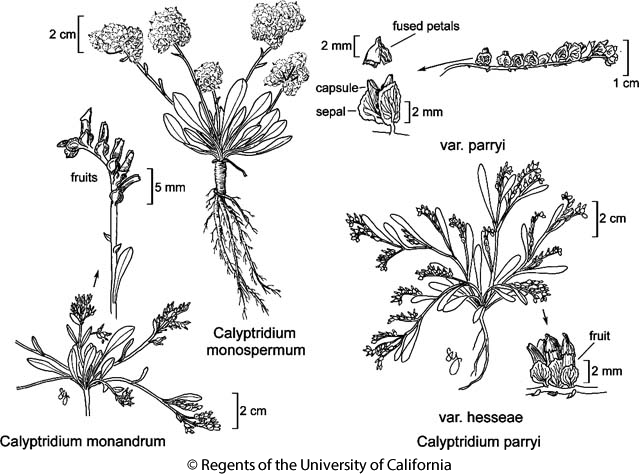 Citation for this treatment: C. Matt Guilliams & John M. Miller 2014, Calyptridium monandrum, in Jepson Flora Project (eds.) Jepson eFlora, Revision 2, http://ucjeps.berkeley.edu/eflora/eflora_display.php?tid=16845, accessed on April 19, 2019.
s SN, Teh, SnJV, CW, SW, SNE, D; Markers link to CCH specimen records. Yellow markers indicate records that may provide evidence for eFlora range revision or may have georeferencing or identification issues. Purple markers indicate specimens collected from a garden, greenhouse, or other non-wild location.